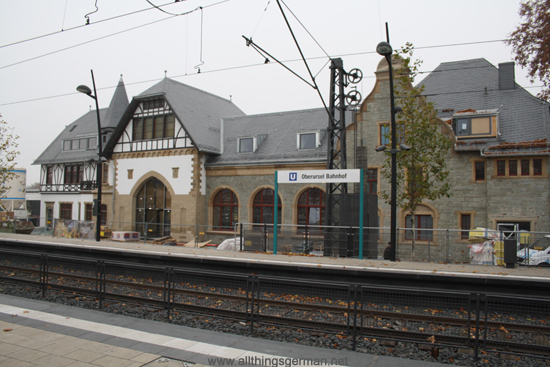 This Whitsun weekend will be one that many people in Oberursel remember for a long time to come, because it was this weekend that the station building re-opening with what may be the first “Bahnhofsfest” that it has even seen. “May be” because no-one knows whether they held one when the building was originally opened in 1901. The day started at 11am when a large crowd gathered in front a stage that had been set up partially on the U-Bahn platform. 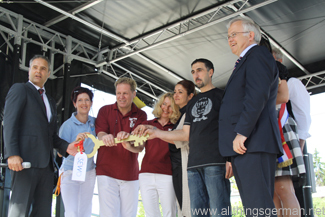 Dr. Justus Förschner of SEWO, the organisation responsible for the renovation work, opened the proceedings with the Mayor Hans-Georg Brum. After a brief look back at the history of the building, how the dual railway connected had benefited the development of the town, and not forgetting the fact that it had taken over 20 years to find a solution to the “station” problem (the building had been run down, with ticket sales only at peak hours), the key was officially handed over to the new tenants. 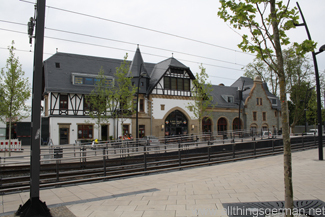 Last November I had a chance to look around the newly restored station building in Oberursel. At the time work was still going on inside the building itself. With the exception of the service store, only the outside had been completed. Many towns in Germany face the same problem – their station building. Not on a scale with Stuttgart, but given that many of them were built in the 19th Century, they often suffer similar fates such as underused ticket offices, high running costs due to the old building materials, and general desire from travellers and locals for the buildings to be put to better use and provide more services. At the same time, they expect them to look good and still retain their 19th Century character, and not get covered in graffiti. With many of them being listed buildings as well, this is not an easy task. Another complication is that the buildings are often owned by Deutsche Bahn, reducing the lack of influence that local towns have over how they are used.